There is nothing quite like a genuine antique oil lamp or a beautiful antique desk lamp to add that feeling of opulence and comfort to your favourite room. The style of antique lamps varies and here you will discover fine examples of Arts and Crafts, Art Nouveau and Victorian gothic lamps. As well as styles there are different types, including beautiful cranberry glass oil lamps, sophisticated desk lamps and even the odd gasolier or electrolier. Whatever style or type of lamp you choose, you will really come to appreciate the particularly warm light that your antique lamps and matching lamp shades provide. One positive aspect of owning a genuine antique oil lamp is its value. 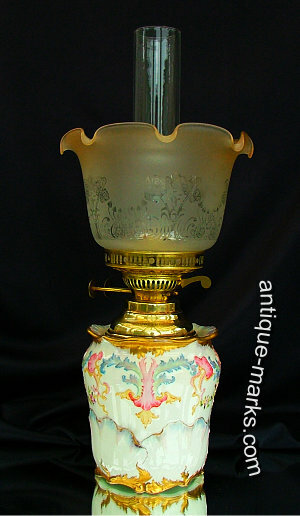 An oil lamp is often viewed as a prize collectible among lamp collectors. Some lamps are simply considered decorative while some are truly functional. A functional oil lamp will have an increased value over its purely decorative counterpart. Particularly if the lamp consists of parts that are in themselves collectable, like original cranberry glass shades or oil holders for instance. When you purchase an antique oil lamp or any antique lamp as a long term investment, it really is essential that you find out if the lamp is in working order. 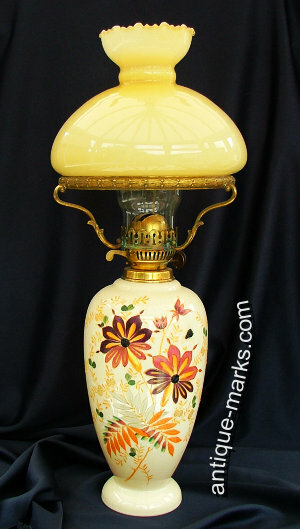 Factors you should consider before buying any antique oil lamp. 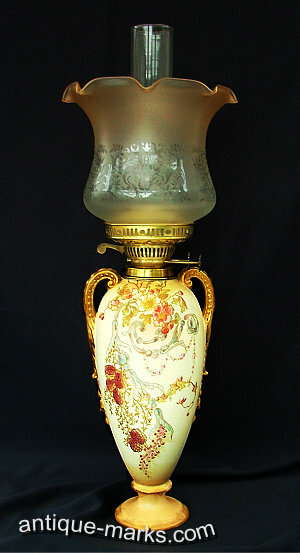 Antique lamps & particularly oil Lamps come in many shapes, sizes and materials. Photos above show an antique Bisto Porcelain Oil Lamp; a Victorian Opaline glass oil lamp; a Victorian porcelain oil Lamp and an antique Brass oil lamp.